Like all the other games of the "Settlers of Catan" series, this game is about building settlements, roads, cities and hiring knights. This time, there is no board on which to place little figures: Every player has his own score card called the building sheet, which depicts a mini Catan (compare with Die Siedler von Catan: Paper & Pencil). You build by drawing the settlements and roads on your score card. To build you still require resources. These are collected by a Yahtzee-like mechanism that involves throwing six special dice (depicting the different resource symbols) up to three times. After each roll, the player can select which dice to keep and which to roll again. In the end, he may build using the thusly determined resources, and is awarded victory points for any finished buildings, which are recorded on the score card. The game lasts fifteen turns or about 15-30 minutes, after which the player with the most victory points wins. Note that the game has been designed for 1-4 players, meaning there is a solitaire version of the game, as well. 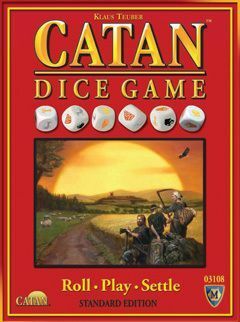 Recent versions include double-sided map sheets and instructions for Catan Dice Game Plus.